gardening in the boroughs of nyc: Finally a bug repellent that works! My sister gave me this bug repellent a couple of weeks ago because she knew that I have been looking for a good bug repellent. I told her about the Off Clip On that I tried and hated. Whenever I'm gardening the nasty mosquitos attack me, and there is nothing I hate more than spending lots of money on a product that does not work. I swear the mosquitos in Staten Island are mutants! Sometimes I wear jeans and a long sleeve shirt outside in the blistering 90 heat, and they still manage to attack me, they bite through my clothing! It's so frustrating because the last thing I want to do is to wear long sleeves and long pants outside when it's 90+! But I swear it didn't help, since the mosquitos still found a way to bite me. What the #$%@! It made gardening so frustrating, because they literally would swarm me. Well I have to say, at first I was skeptical because I've tried a lot of other bug sprays and none seem to work. This one is a wipe on disposable cloth, however it is also sold as a spray. Okay, ready for this. This stuff REALLY WORKS!!! To my pleasant surprise, every time I use this it's like I have an invisible armor on, because no mosquitos come near me. Hello, awesome! It's also odorless and not sticky like other bug sprays. 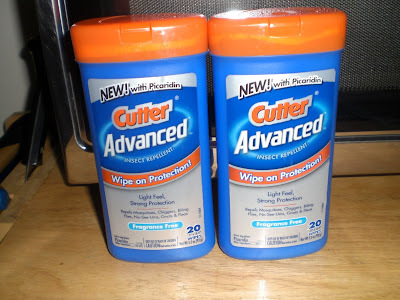 Cutter calls this their "Advanced" bug repellent, it uses picaridin, a synthetic ingredient that is said to be comparable to a low-concentration DEET insect repellent in effectiveness, however is not DEET. This is what I don't get though. I have another Cutter spray at home that is Family version that has DEET. That spray does not work. So what I want to know is why bother offering a bug spray that doesn't work?? Why not just sell the "Advanced" one? It's the first bug spray I've ever bought that I LOVE and recommend to others! I am happy to hear that you found a product to give you some relief from those bugs! We don't have a problem with them here. Glad you've found something that works, and that we don't have any mosquitos here! Not sure I could cope. Thanks so much! I also garden in long pants and cover myself with spray. The Clip On didn't work for me either. I'll definitely pick some of that up next time I'm out. Thanks again. I'll have to try this one...I must be sweet...I always get eat up. Good to know!!! Thank you! It really is an excellent product! I'm stocking up on this stuff! I have 3 packages of it! LOL. It's great finding products that solve a problem!